Okay folks, time for another Fit Rebel rant. This time I’m taking aim at that time-honored practice known as the personal training assessment. As a trainer, I’ve done more than my share of these things and I still do them for sure, but over time I’ve come to see them in a very different light than I once did. First off, is the notion of the free assessment as an incentive. We trainers love to put out the free assessment as a proverbial carrot for signing up for a gym membership or personal training package. I laugh now when I think of how much I did this. It’s funny to imagine there were mobs of people just dreaming of the day when they could get poked, prodded and assessed on their fitness level. I remember back in grade school when we all used to do fitness assessments and everyone, even I, hated doing them. I have yet to meet someone who honestly really wants a fitness assessment. It’s kind of hard to offer it as an incentive when it’s not exactly at the top of every one’s wish list. Then came the push-up test, the sit-up test, the cardio test and on and on and on. Over time I realized that much of the test was kind of frivolous. I once had a marathon runner who wanted to improve his 5k time. 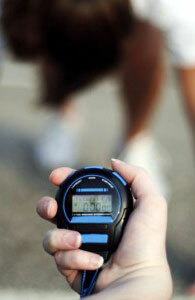 So why the heck did we do the classic step test to measure his cardiovascular endurance? He was a state champion marathon runner for heaven’s sake. What on earth could we possibly learn from having him step up and down at 120 BPM for four minutes? “Hey congrats, your cardio level is pretty good!” Thank you Captain Obvious! Plus, there’s the whole relevance of the test to their goals. If we really wanted to do a test we should have been testing what we want to see change, which is his 5K time. Which of course he already knew. I also once had a basketball player who wanted a higher vertical leap. So why should we test how many sit-ups he can do when that’s the last thing on his mind? Finally we have to question the whole need to assess something in the first place. I used to use the assessment as a way to gage one’s fitness level so we knew what to work on and improve. I soon learned this makes as much sense as doing a hunger assessment when walking into a restaurant. The individual is already in the gym and coming to the trainer with the desire to change something, and I’m willing to bet they already have an idea of what they would like to change. Do they really need a test to figure out they lack upper body strength when it’s been something they want to improve upon for years? And then we have the classic idea that we need an assessment so we can track and measure progress to know that a change has occurred. I’m sorry, but changing the human body should be like falling down a flight of stairs – you always know when it happens. Unless you’re really looking for fine-tuning (like going from 8% body fat to 6%), the changes shouldn’t require a costly and lengthy test to know they are happening. They should be blatantly obvious. These days, my assessments are very different from they used to be. First, I encourage the client to get a medical screening by their family doctor since their doctor is far more thorough and capable than I will ever be at such a thing. Then we quickly test the fitness characteristics that the client feels are relevant and important to know. This is quick and to the point, taking about 20-30 minutes. If they don’t want to be tested for body fat or flexibility, I see no reason to push the issue. Then, once we have a plan for what we want to accomplish and set a few goals, it’s down to the training itself and making those goals a reality. I figure that’s what they might have been wanting all along.